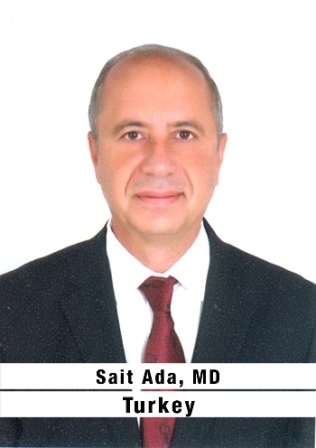 Prof. Dr. Sait Ada was born in 1956, in Turkey. In 1979, he graduated from Medical Faculty of Ege University where he also completed his residency in 1984 in the Orthopedics and Traumatology Department. During years 1986-1987, he was trained in hand surgery for a year in Germany by Prof. Dr. Ulrich Lanz (Chief of Deparment of Hand Surgery of Würzburg University) and Prof. Dr. Dieter Buck Gramcko (Chief of BG Klinik Hamburg). He is one of co-founders of the Hand and Microsurgery & Ortopedics and Traumatology Specialized Hospital (“EMOT”) which was established in 1991, in Izmir, Turkey and since 1998, he is the managing director of EMOT.Between years 2010 and 2012, he served as the President of Turkish Hand and Upper Extremity Society, and in 2013 as the President of 18th European Hand Surgery Meeting in Antalya in 2013. At present, he serves as the President of Turkish Orthopedic and Traumatology Society and he has 21 publications in SCI and SCI–E Journals. He is an international member of ASSH (American Hand Surgery of Hand) and DAH (German Speaking Countries Hand Surgery Society). He is proficient in Turkish, English and German.